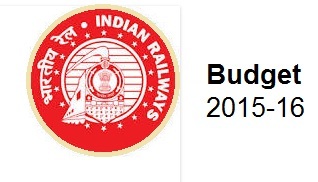 New Delhi: Union Railway Minister Suresh Prabhakar Prabhu today announced that the size of the Plan Budget for Indian Railway has gone up by 52% from Rs. 65,798 crore in 2014- 15 to Rs. 1,00,011 crore in 2015-16. Support from the Central Government constitutes 41.6% of the total Plan Budget and Internal generation 17.8 %. Introducing the Railway Budget for 2015-16 in Parliament today Prabhu said that in view of the fact that it would be a challenging task to initiate the mobilization of extra-budgetary resources, it is proposed to set up a Financing Cell in the Railway Board, which would seek the benefit of advice from experts in this field. The Railways intend to fast track the sanctioned works on 7,000 kms of double/third/fourth lines and commission 1200 km in 2015-16 at an investment of Rs. 8686 crore. a) To deliver a sustained and measurable improvement in customer experience, the Indian Railways is launching initiatives that will systematically address customer concerns about cleanliness, comfort, accessibility, service quality and speed of trains. b) To make Rail a safer means of travel. d) To make Bhartiya Rail financially self-sustainable, the Indian Railways will generate large surpluses from its operations not only to service the debt needed to fund capacity expansion, but also to invest on an on-going basis to replace its depreciating assets. This will require material improvement in operating efficiency, tighter control over costs, greater discipline over project selection and execution, and a significant boost to Railways’ revenue generating capacity. The Railways Minister informed the members that for financing remunerative projects through market borrowings, it is intended to tap low cost long term funds from insurance and pension funds, multi-lateral and bilateral agencies which can be serviced through incremental revenues. Railways will create new vehicles to crowd in investment from long-term institutional investors and other partners. These may include setting up an infrastructure fund, a holding company and a Joint Venture with an existing NBFC of a PSU with IRFC, for raising long term debt from domestic as well as overseas sources, including multilateral and bilateral financial institutions that have expressed keen interest in working closely with Railways in this endeavor. Railways will monetize its assets rather than sell them, he added. Prabhu announced that Railways proposes to install Train Protection Warning System and Train Collision Avoidance System on select routes at the earliest. Presenting the Railway Budget for 2015-16 in Parliament today, he informed the members that to prevent fire in coaches and also prevent coaches from climbing over each other during accidents, RDSO has been asked to develop new systems. The Railway Minister informed the members that to curb derailments, modern track structure consisting of sleepers and heavier rails are being used while carrying out primary track renewals. Better welding techniques would also be promoted. Further, analogue machines for testing of rails are being replaced with digital type machines, which are more reliable. Prabhu informed Parliament that that the Railways intends to set up a working group to modify the present system of accounting, to ensure tracking of expenditure to desired outcomes. He said that Railways have limited resources and thus must ensure that all public expenditure results in an optimal outcome. The data on costing would be available online including costs incurred on constructing, augmenting, maintaining and operating railway lines. This would also help in undertaking post commissioning evaluation studies. He informed the members that Railways proposes to have the train operations audited with a view to increasing productivity and bringing in transparency. Railways is also proposing to expand paperless working in material management system. In line with the focus on ease of doing business, it will digitally integrate vendors through Vendor Interface Management System to provide single window interface to vendors. In the next financial year, 970 safety-related works to eliminate 3438 level crossings at a total Railway expense of Rs. 6,581 crore have been sanctioned. This is more than 2600% higher than the sanctioned number of safety-related works during the current year and the highest ever in recent times. 8.Railways to continue to be the preferred mode of transport for the masses.